When you make these dresses, you sure hope you get some use out of them. Because of some cancelled outings, I didn’t wear as many as I would have liked but some did get used. In May, my 1861 Senora dress went to the old fort. And 1845 Atessa went to Kildonan Cemetary and Church. My 1903 skirt and blousewaist went to Dalnavert Museum at the end of May. In July, my medieval costume was worn at the Cook’s Creek Medieval Festival. 1909 Olive made an appearance as a movie extra in August. And the last outing was in October for the annual train robbery. I wore an 1895 walking outfit. 6 out of 20 worn this year. Hopefully, next year, there wont be so many cancelled trips so more of my children can get out and play. Last year I posted my non-resolution goals. I use the word non-resolution because New Year’s Resolutions have a negative connotation to me…things that cause me stress and then later disappointment. Goals are things to strive for. If you achieve them-GREAT, if not, oh well, try again next year. Even a slight amount of progress towards a goal is a win. Slight progress on a resolution feels like a loss to me. Yes, yes, semantics….tomato-tomahto. Anyway one goal was to reduce the stuff in my house because the amount is overwhelming. I have been pretty good about ditching old clothes that don’t fit or I don’t like any more. In terms of my blog topics, I have reduced my UFO pile. My Olive dress is the best example of that! I had hoped to start/finish the corset and pink and blue dress but that is a no. But I did at least decide on what the purple fabric Lottie picked up for me in the States would be. So not a blazing success but progress and that is a win. Now as I look around at some of my Christmas crap that I have put up, I realize there are some that I just don’t love any more and I think they are hitting a box for donation…perhaps today. In my last post I shared the photos of my completed Olive Dress. What I didn’t tell you was where I was when those photos were taken. I was actually an unpaid extra in a movie about the 1919 General strike in Winnipeg that became a very prominent event in the history of Canada. 30 thousand workers from many classes and ethnic groups came together and marched and basically shut down the whole city. The strike was so effective that the Canadian government (for fear that there would be sympathetic strikes across the country) became involved and the leaders were arrested. The scenes I and the other extras were involved in were the street marches and the rush of deputized RCMP’s on horseback who were sent in to break up the strike. This resulted in several injuries and one death. New life experience to add to my memories. Not a bucket list thing but pretty cool non the less. I wonder if this film will ever move beyond film festivals to a venue I might actually see it. I found a person that might actually buy some of my costumes off of me. I have about 3 that I’m not really in love with anymore and if I made something that I liked better, I’d be happy to part with them. I actually got offered a job. It is to work as a casual seamstress in the costume department. The deal is that if a production requires more costumes than the costume department can crank out, they will call on casuals to step in an help out. The money could be quite good, and according the person I spoke to, they always need help. Since I’ve never sewed for other people, this is a daunting thought! I’m curious enough to want to ask more questions but scared enough to believe that I wont go for it. I wish I had some more photos to share with you but something went screwy with my camera and I lost all my photos. Nothing like a dead line to get a UFO to the finish line. 1909 Olive dress is done. Finally. I only conceived of the idea and bought the fabric 2 years ago! It had its first trip out last Thursday. There are a couple of things I hope to tweek eventually but for now it is done and wearable. One of the things I want to fix on this dress is the decorative buttons on the bodice. They need to move up a bit. I have to remember to smooth down the bodice over the “girls” after I lift my arms. Other than that, I am happy with how it turned out. It was pretty comfy. I may opt to move the buttons on the stomach up but I will wait and see what it looks like with the skirt. And after I iron it. I’m back to working on my dress, Olive. There was a lengthy lull in the progress but in the past two weeks I got the Dorset buttons done, the sleeves are on, the undersleeves are made, the closure is started and one sleeve is fully decorated. I feel good about this. At this rate, I may get it done on time to wear next month! I am still having computer issues so this is being done on my phone. In order to avoid aggravating my carpel tunnel, I am going to make this short and sweet. 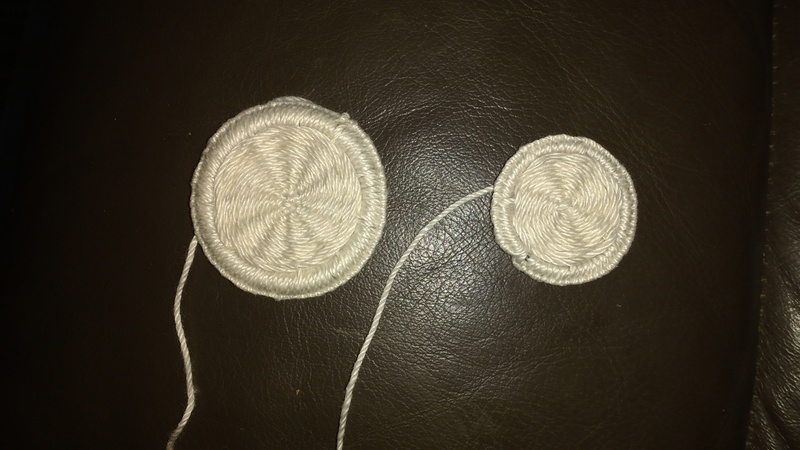 I wanted Dorset buttons for my Edwardian dress but couldn’t find rings in the size I wanted. I settled for huge ones and made several buttons. Of course I have since found a different size. A better size so I am making these up instead. What to do with the huge ones? Here they are side by side.